New project launched to preserve Jewish cemetery in village where Chabad movement was based for over 100 years. The European Jewish Cemeteries Initiative (ESJF), together with the Chabad-Lubavitch Hassidic movement and Geder Avos Jewish Heritage Group, Inc. held a historic unveiling ceremony yesterday of a new preservation project at the Jewish cemetery in Lubavitch, Russia, the small village where the Chabad movement was based for over 100 years and where some of its major rabbis and historical figures are buried. 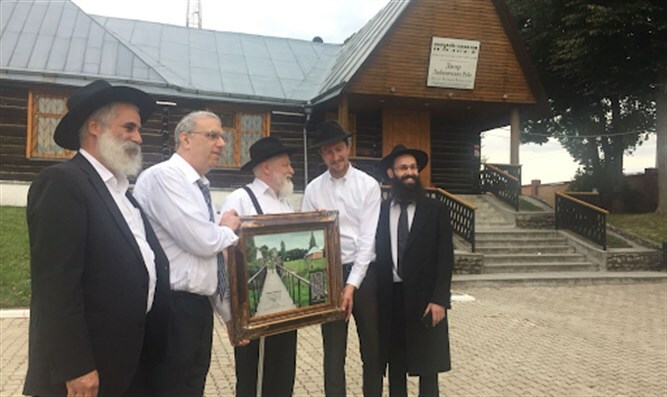 The project in Lubavitch is the first undertaken by the ESJF in the Russian Federation after the completion of numerous fencing projects in Ukraine, Poland, Serbia, Moldova, the Czech Republic and Belarus, and has been made possible thanks to the generous support of Mr. and Mrs. Joseph Popack of the United States. Mr. Popack’s grandfather studied at the Tomchei Temimim Talmudic College, the first of many branches of Chabad yeshivas bearing the same name today around the world. Founded in 2015, the ESJF has preserved and built fences in more than 100 Jewish cemeteries in seven countries in Central and Eastern Europe, mostly in the towns and villages whose centuries-old Jewish communities were destroyed in the Holocaust. Often, the Jewish cemetery is the single remaining witness to the once flourishing Jewish community life that existed for so long in these settlements and its preservation is therefore both a key religious and moral obligation for Jews as well for the maintenance of the memory of the Holocaust and its lessons for future generations. This ESJF project in Lubavitch, the first of its kind in Russia, included the preservation, fencing, lighting and construction of a new access road and bridge at this cemetery, which was founded in the early 19th century. The ceremony was attended by numerous guests from the United States and Israel and leading rabbis of the Chabad Lubavitch movement, including Rabbi Yehuda Yeroslavsky, general secretary of the Chabad Bet Din in Israel and Rabbi of Nachlat Har Chabad in Kiryat Malachi, Rabbi Yitzchok Kogan, director of Agudas Chasidei Chabad in Russia and Mr. Eduardo Elsztain, philanthropist and activist from Argentina. The ceremony was addressed by Mr. Popack, Rabbi Schapira and Rabbi Yochanan Gurary, chief Rabbi of Holon, Israel and Rabbi Leib Altein, editor in chief of Heichal Menachem publications.